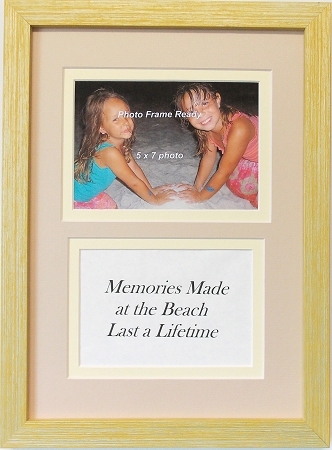 Wall Art Photo Frame 15.5 x 11.25 with a Decorative Sign: Memories are Made at the Beach Last a Lifetime in a yellow wood textured frame. Double mat with sand color top mat and yellow bottom mat to match yellow frame. 1/2 inch revel of bottom mat, with beveled edges. Wall mount system includes, mount board glass and wall hanging system.